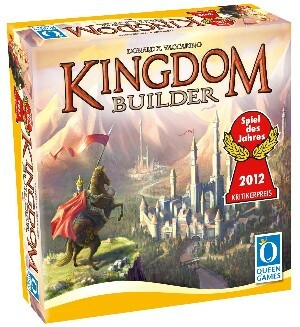 Kingdom Builder is a strategic area control and construction board game. Players must create their own kingdom by constructing as many settlements as possible in order to earn as much gold as possible. 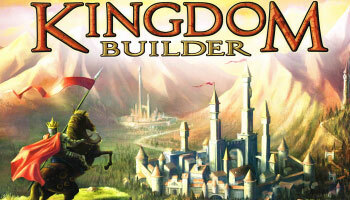 You play with 40 wooden houses and a random board built with modular sections (hexes) offering random abilities. Three random criteria for scoring are selected and each player gets one card with a terrain type on it. On your turn, you can place 3 wooden houses on that terrain type and draw a new card. The houses must be placed adjacent to your other houses if possible, else you can place them on that terrain type anywhere else on the board. You can also get special abilities when you place a house next to them on the board. When a player runs out of houses, everyone can end their turn and the game ends. The scoring phase can start and the player with most points is the winner. Each game will have it's own victory point conditions, helping to make each game different. Select any 4 of the 8 game board sections and assemble them to a rectangular game board as shown in the example below. Place four summaries of location tiles next to the game board pieces matching the location hexes. Place 2 corresponding location tiles on each location hex.